Wreaths can be seen in many different settings and contexts. 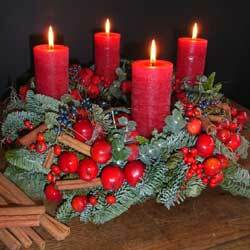 During the season of Advent wreaths can be found on tables or the heads of maidens. These become the base for candles which are lit one by one on each Advent Sunday. 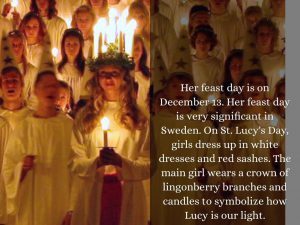 On St Lucy’s Day candle bearing wreaths form crowns on the heads of girls re-imagining the saint. 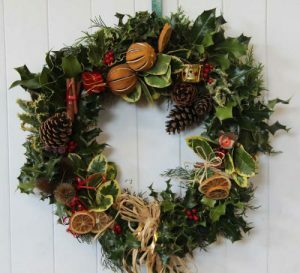 Once the wreath is mounted on a door it becomes known as a Christmas wreath and comes in all variety of size or design. Traditionally a wreath is an assortment of flowers, leaves, fruits, twigs, moss or various materials that are woven together to resemble a ring. Wreaths have a good deal of history and symbolism associated with them. They are usually made from evergreens and symbolize strength since evergreens last even throughout the harshest winters. Of course these days many Christmas wreaths are also made from artificial materials.